Why I write this list? What area of Greater Atlanta is covered in this list? This list covers the entire Metro Atlanta area, a total of 31 Counties. 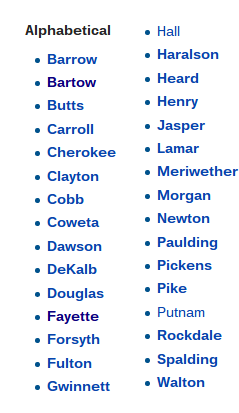 Wikipedia provides a list of 31 Metro Atlanta Counties. If you look for your county and it is not in the list. It means none of the high schools in your county made the list. Why a list of High schools? Among the three, elementary school, Middle school and High school, we felt that the High school alone was enough to give us a good indication of the other two. A high school receive students from the local middle school, who received students from the local elementary school. The performance of the high school is a direct result of the performance of the elementary and middle school. A list of best high school is enough to give us an impression of the local elementary and middle schools. Every school in the list are very good schools. Under each county, the very best schools are listed first. For example, In Cherokee county Sequoyah High School is a better school than Woodstock high school. Please note that a few of these schools are charter schools and special program schools that might be in your area but not open to the general population. This is the complete list of the best schools in Atlanta Metro. This is 59 high schools out of approximately 120 high schools. These are the top high schools. If you see any mistakes in our list, please let us know. If you have anything to share, please feel free to leave a comment below.